This morning Betty and I came here for a walk. 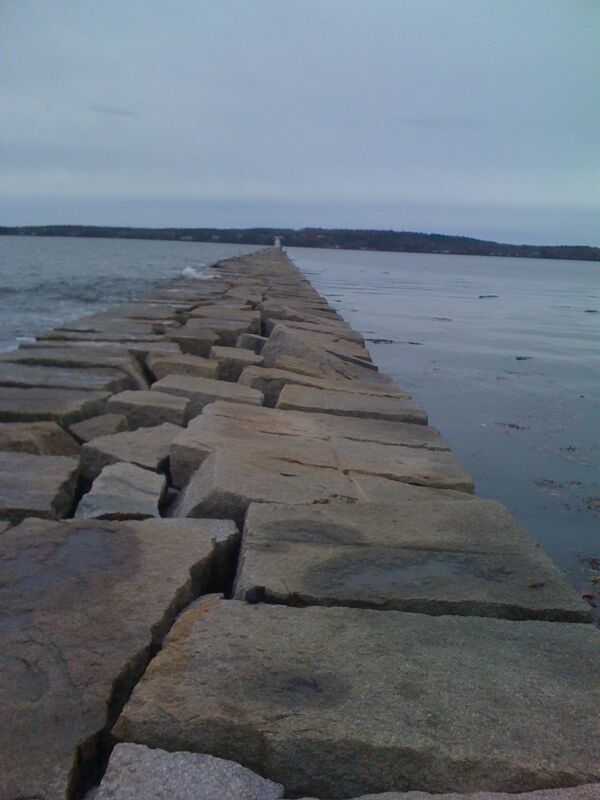 If you squint, you'll see a lighthouse at the end of this seawall. It is 7/8ths of a mile long. When I read that on a sign I cracked up, it is just so furniture-making-school. Actually, if it had said 29/32nds it would really be furniture-making-schoolesque. Anyway, at 10 AM it looked like this and we got about 11/36th of the way and waves were splooshing over the rocks. I was wondering if maybe the tide was still coming in and we'd get out to the lighthouse and be stuck for hours waiting for it to go back out. I asked some fishermen who said that they'd been out on it walking through 2 inches of water in the past. It is November. I was wearing sneakers. Amy told me that a woman had recently been swept into the brink. We turned around. We came back at 5PM. The tide must have been all the way out cause there was at least 10 feet of wall and tons of beach. The sign in the parking area said open sunrise to sunset and the sun was definitely setting spectacularly over Rockland, when we were only about 9/32nds of the way out. Betty was a bit wary of the gaps between the rocks, but we booked on. It started to feel like something from a surreal dream sequence in a French or Spanish movie from the 30s. The thing just kept going and going. I reeeeally wanted to get to that lighthouse and not be thwarted yet again in the same day, but it just felt like we weren't getting anywhere. And it was getting darker. Then and there I made up my mind not to give up. A personal challenge to be brave. Hey, was I holding myself back in my ambitions in my class? I have been leaning toward the idea of concentrating on learning the "skills" very well - even willing to forego a lot of "construction". But I realize that is wimpy. Fearful. Like practicing hitting a tennis ball your entire life but never playing a game. No matter how sucky you may be, playing the game is when you improve/move forward. I decided I did want to make stuff and so what if the first few pieces were homely? They can only get better. How will I ever know how good my skills are if I don't give myself a chance. And besides, I love the idea of designing something beautiful. We got to the windmill, - I mean, lighthouse, walked around it and then picked our way back. It wasn't even that dark by the time we finished, Mom! We're fine. I took myself to a dinner in a nice place. I sat at the bar and ate Pemaquid oysters with an apple mignonette. It is good to be brave. 3/32 of me wishes I was there, too. But it's chilly enough here. 11/16ths of me wishes I had been there with you to hear about the parallel lines between walking to the lighthouse and what we do in class. I'd also go for the apple thingy but skip the oysters.